The Geography of Protest: Camp Casey 1, Crawford. Natural catastrophe provokes, more than any other kind of human drama, the strongest sentiments of tragedy and loss. As is most recently evident following hurricane Katrina’s onslaught on the northern Gulf Coast, Americans are more than willing to share the collective burden offering necessary support to those who have become the storm’s unwitting victims and refugees. The country becomes united, if but only momentarily. The war being waged against terror, to keep to the current euphemism, launched on distant soils, is meanwhile taking its own desperate human toll on soldiers and civilians. This drama, immensely destructive in its own right, has so far failed to achieve any form of national consensus. But in a recent turn of events, Iraq has suddenly become more real to Americans, because of a face-off that took place on a miniscule patch of land located some 8 miles northwest of Crawford. This very small juncture between President Bush’s vacation retreat and a one light rail town in the middle of Texas became, if only for about a month, the most contested crossroads in the country. By the end of the summer, on August 27, tensions here reached an all time high. 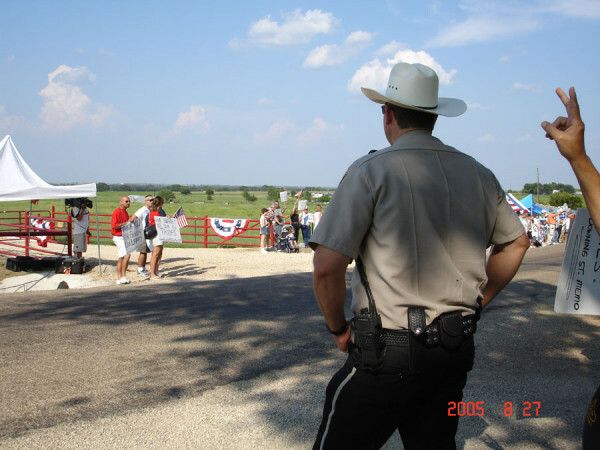 Under the scorching afternoon sun, Texas Sheriff’s deputies escorted several people across police lines to the opposite side of Prairie Chapel road, where a makeshift memorial to America’s Iraqi war losses had been erected. 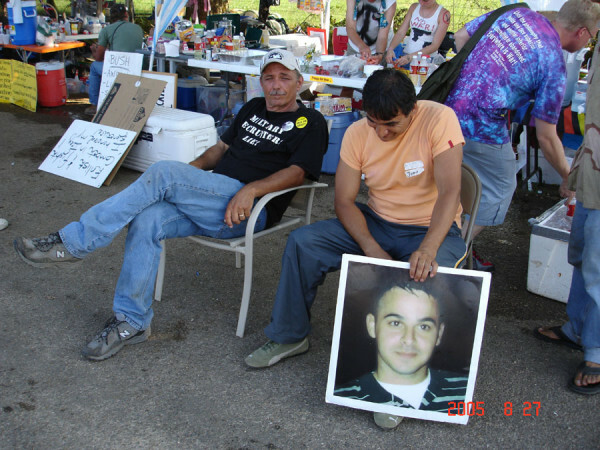 These were parents of dead soldiers who wanted no part of the growing anti-war protest. During the day, on several occasions, the act was repeated as relatives removed nametags from one or another white painted cross. The tribute was initiated by Cindy Sheehan, herself a mother of a Marine who died on the battlefield. 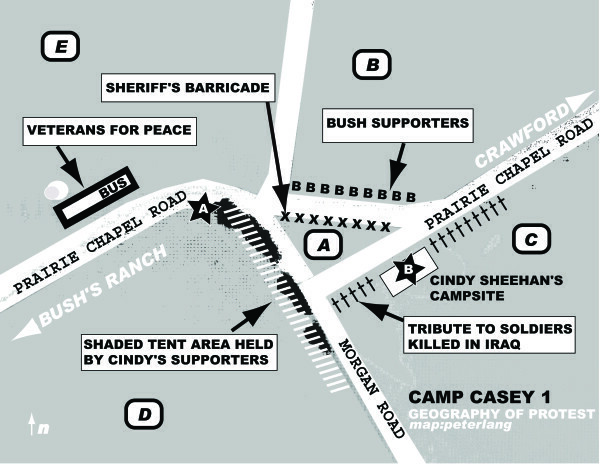 The crosses had been assembled in a narrow strip of turf that served as the base camp for Sheehan and numerous anti-war sympathizers (zone “C”). Emotionally tense moments as these were captured by the press on video for the evening’s news. The police escorts were not there to protect the parents from the anti-war protestors, however, but were there to protect the anti-war protestors from possibly violent aggression coming from the pro-war side. About a week earlier, on August 15, late into the night, a local Crawford man had mowed down about 300 of the white crosses, crushing them under his tractor. These incidents exposed just how symbolic this one small triangular intersection outside the town of Crawford had become in something less than twenty days time. 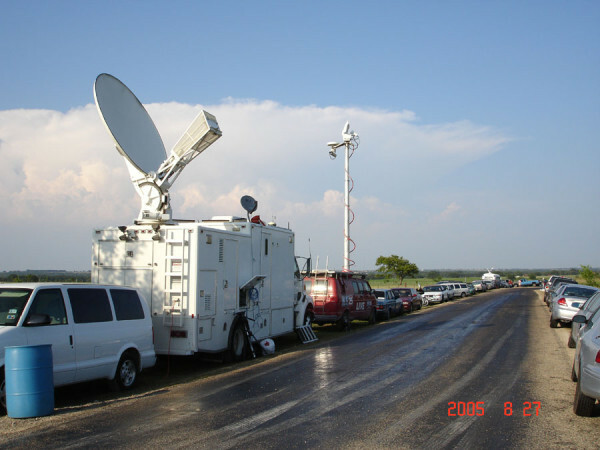 Press coverage had increasingly focused on the frustrated battles between opposition camps: while the pro-Sheehan crowds gathered under the shade trees on the southern side of the area (zone “D”), pro-war agitators shouted and waved flags from the other side behind police lines in the open sun(zone “B”). Cars, pickup trucks and Harleys cruised nervously up and down this segment of Prairie Chapel road to observe and participate in this Texas style showdown. The tug of war over geographical positions began when the Veterans for Peace “Impeachment-Tour” bus was prevented, when they arrived on August 6, from dropping off a then unknown Cindy Sheehan at the gates of the presidential compound. 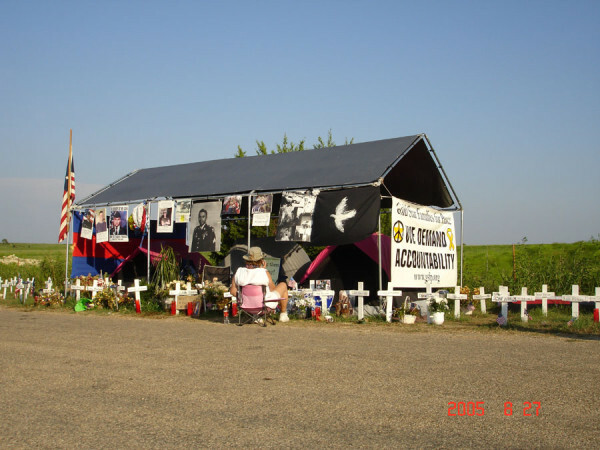 The trip, arranged by a California chapter of the Veterans for Peace had been originally planned as a protest road-tour through the US, with a stop in Crawford. 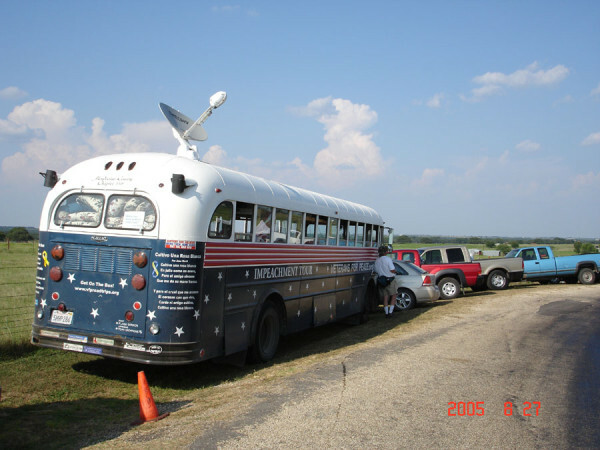 Parked on the opposite side of Prairie Chapel Road (Zone E), the Veteran’s bus, a 1977 Gilly School bus would later serve as the strategic mobile headquarters equipped with broadband satellite internet. Sheehan instead chose to set up camp at this widening, at the triangular junction formed by Prairie Chapel and Morgan roads, in a ditch(star “A”). 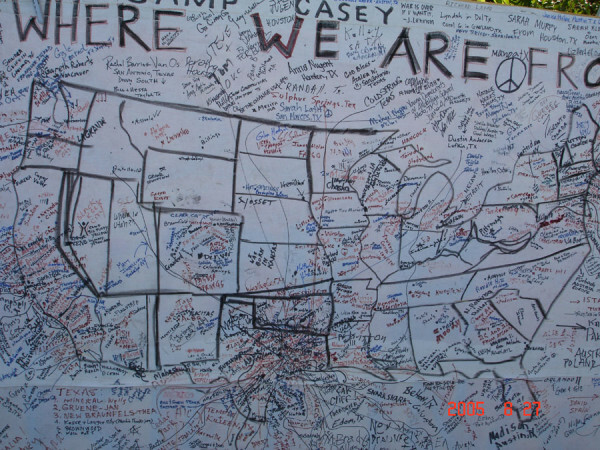 The site was named Camp Casey in memory of Sheehan’s lost son. 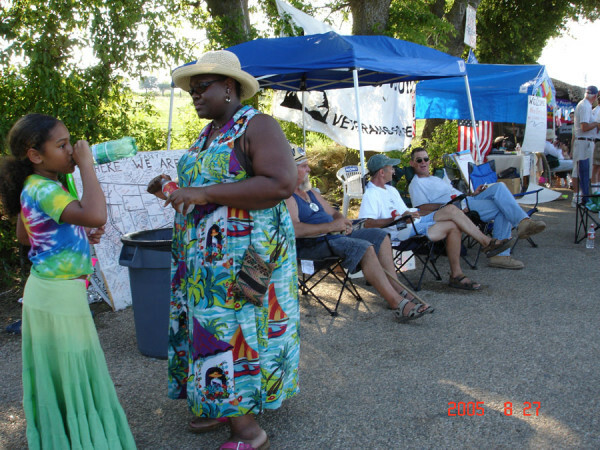 This site, later referred to as Camp 1, gradually grew in number as more and more veterans and peace supporters converged there. Sheehan eventually repositioned her tent over to the eastern shoulder of the triangular patch (star B). The camp grew along the runoff ditches parallel to the public thoroughfare and between the fences marking off neighboring private properties. Until the last week in August, which coincided with the end of President Bush’s month long vacation, this site was relatively calm, but as the war in Iraq took a turn for the worse and gas prices at the pump jumped significantly around the nation the standoff at Camp Casey grew increasingly tense. 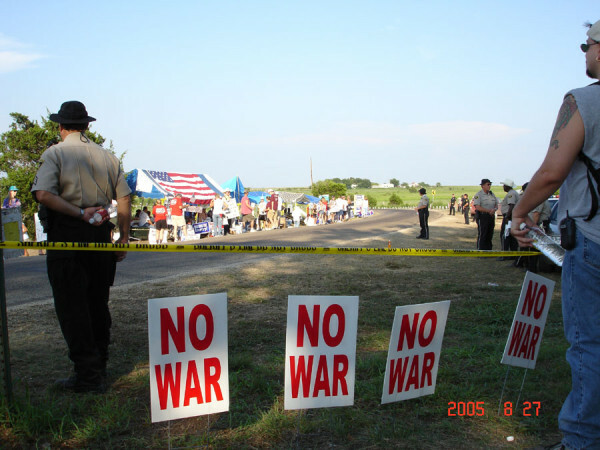 Around August 22, Camp 2, established with the support of one of the neighboring landowners on a large acreage plot right next to the Bush compound, was created with the help of the anti war group Code Pink. This new campground permitted crowds of up to 2000 people to gather by the end of August. This area, however, could not accommodate parking for the anti-Sheehan protestors, forcing their contingents back on Camp 1. Camp 1, the nucleus of the original protest, therefore continued as the frontline location and primary terrain for the two groups facing off. 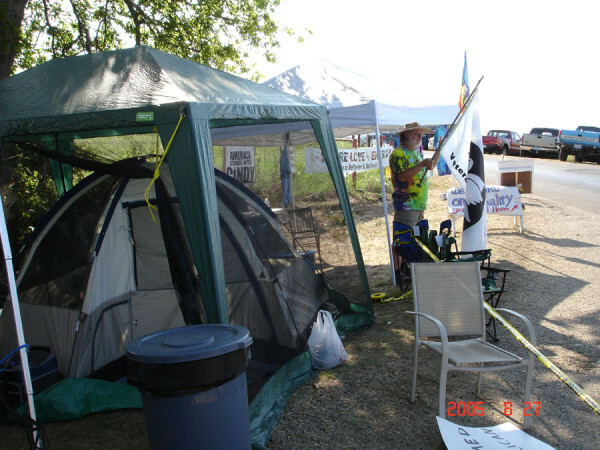 Camp 1 drew growing numbers of visitors, tourists, activists and provocateurs. With Iraq a distant point in the American conscious, Camp Casey has become by default the most poignant piece of land to capture the nation’s imagination on the subject of war. 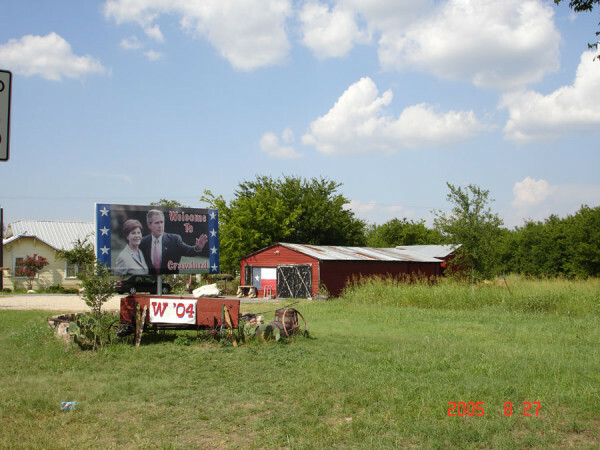 The dirt triangle bounded by Prairie Chapel road has come to represent one of the most politically divisive struggles to be played out on US territory in recent history. This is one piece of real-estate that will not be soon forgotten. See www.vfproadtrips.org for daily postings on the Veterans for Peace initiative, and their upcoming travel program.